Hillary Clinton went to her new office today and met with State Department employees. She received a warm welcome. Secretary of State Hillary Clinton received a rousing welcome this morning when she arrived at Foggy Bottom for the first time, as cheering foreign service and civil service employee packed every inch of the C Street lobby, including the balcony overlooking the flags of foreign nations. Check out the new State Department Website. 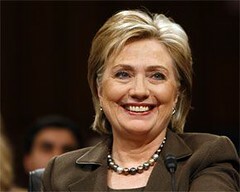 It has Hillary's theme, Diplomacy in Action and a transcript of her confirmation hearing testimony.